Kingman Reef /ˈkɪŋmən/ is a largely submerged, uninhabited triangular-shaped reef, 9.5 nautical miles (18 kilometers) east-west and 5 nmi (9 km) north-south, located in the North Pacific Ocean, roughly halfway between the Hawaiian Islands and American Samoa at 6°23′N 162°25′W﻿ / ﻿6.383°N 162.417°W﻿ / 6.383; -162.417. 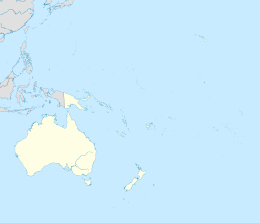 It is the northernmost of the Northern Line Islands and lies 36 nautical miles (67 km) northwest of the next closest island (Palmyra Atoll), and 930 nautical miles (1,720 km) south of Honolulu. The reef encloses a lagoon up to 270 feet (82 m) deep in its western part. [self-published source] The total area within the outer rim of the reef is 29 sq mi (75 km2). There are two small strips of dry land composed of coral rubble and giant clamshells on the eastern rim with areas of 2 and 1 acre (8,100 and 4,000 m2) having a coastline of 2 miles (3 km). The highest point on the reef is less than 5 feet (1.5 m) above sea level, which is wetted or awash most of the time, making Kingman Reef a maritime hazard. It has no natural resources and supports no economic activity. Kingman Reef has the status of an unincorporated territory of the United States, administered from Washington, D.C. by the U.S. Department of Interior. The atoll is closed to the public. For statistical purposes, Kingman Reef is grouped as part of the United States Minor Outlying Islands. In January 2009, Kingman Reef was designated a marine national monument. 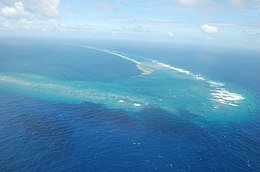 Kingman Reef was discovered by the American Captain Edmund Fanning of the ship Betsey on June 14, 1798. Captain W. E. Kingman (whose name the island bears) described it on November 29, 1853. Kingman Reef was claimed in 1860 by the United States Guano Company, under the name "Danger Reef". This claim was made under by the Guano Islands Act of 1856 although there is no evidence that guano existed or was ever mined on Kingman Reef. On December 29, 1934, the US Navy assumed jurisdiction over Kingman Reef. The lagoon was used in 1937 and 1938 as a halfway station between Hawai'i and American Samoa by Pan American Airways flying boats (Sikorsky S-42B). Pan Am wanted to expand flights into the Pacific and include Australia and New Zealand to their "Clipper" air routes. In 1935 it was decided that the lagoon at Kingman Reef was suitable for overnight stops en route from the U.S. to New Zealand via Samoa. 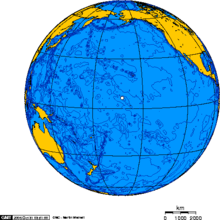 Kingman Reef became the stopover to and from Pago Pago, American Samoa, located 1,600 miles (2,600 km) further south. A supply ship, the North Wind, was stationed at Kingman Reef to provide fuel, lodging, and meals. The S42B Pan American Clipper II, piloted by Captain Edwin Musick, landed at Kingman on its first flight on March 23, 1937. Several successful flights followed, but the flight on January 11, 1938 ended in tragedy. Shortly after the early morning take off from Pago Pago, bound for New Zealand, the Clipper exploded. The right outboard engine had developed an oil leak and the plane burst into flames while dumping fuel; there were no survivors. As a result of the tragedy, Pan Am ended flights to New Zealand via Kingman Reef and Pago Pago. A new route was established in July 1940 by way of Canton Island and New Caledonia. On February 14, 1941, President Franklin Roosevelt issued Executive Order 8682 to create naval defenses areas in the central Pacific territories. The proclamation established "Kingman Reef Naval Defensive Sea Area" which encompassed the territorial waters between the extreme high-water marks and the three-mile marine boundaries surrounding the atoll. "Kingman Naval Airspace Reservation" was also established to restrict access to the airspace over the naval defense sea area. Only U.S. government ships and aircraft were permitted to enter the naval defense areas at Kingman Reef unless authorized by the Secretary of the Navy. Kingman Reef supports a vast variety of marine life. Giant clams are abundant in the shallows, and there are approximately 38 genera and 130 species of stony corals present on the reef. This is more than three times the species diversity of corals found in the main Hawaiian Islands. The ecosystem of the reef and its subsequent food chain are known for the distinct quality of being primarily predator-based. Sharks comprised 74% of the top predator biomass (329 g m-2) at Kingman Reef and 57% at Palmyra Atoll (97 g m-2), low shark numbers have been observed at Tabuaeran and Kiritimati. The percentage of the total fish biomass on the reef is made up of 85% apex predators, creating a high level of competition for food and nutrients among local organisms — particularly sharks, jacks, and other carnivores. The threatened green sea turtles that frequent nearby Palmyra Atoll travel to Kingman Reef to forage and bask on the coral rubble spits at low tide. However, above sea level, the reef is usually barren of macroorganisms. Mainly constructed of dead and dried coral skeletons, providing only calcite as a source of nutrients, the small and narrow strips of dry land are only habitable by a handful of species for short periods of time. Most flora which begin to grow above water — primarily coconut palms — die out quickly due to the fierce tides and lack of resources necessary to sustain plant life. On September 1, 2000, the Navy relinquished its control over Kingman Reef to the U.S. Fish and Wildlife Service. On January 18, 2001 Secretary of the Interior Bruce Babbitt created the Kingman Reef National Wildlife Refuge during his final days in office with Secretary's Order 3223. It is composed of the emergent coral rubble spits and all waters out to 12 nautical miles (22 km). While there are only 3 acres (0.012 km2) of land, 483,754 acres (1,957.68 km2) of water area is included in the Refuge. Along with six other islands, the reef was administered as part of the Pacific Remote Islands National Wildlife Refuge Complex. In January 2009, that entity was upgraded to the Pacific Remote Islands Marine National Monument by President George W. Bush. Since the early 1940s, Kingman Reef has had very little human contact, though amateur radio operators from around the world have occasionally visited the reef to put it "on the air" in what is known as a DX-pedition. In 1974, a group of amateurs using the callsign KP6KR sailed to the reef and set up a temporary radio station and antenna. Other groups visited the island in subsequent years, including 1977, 1980, 1981, 1988 and 1993. Between November 15, 1945, and March 28, 2016, Kingman Reef was considered a discrete entity for the purpose of earning awards such as the DX Century Club. A video shot by amateur radio operators traveling to the K5P DX-pedition on Palmyra in January 2016 appears to show Kingman Reef mostly awash, raising questions as to whether a future activation of Kingman Reef would be possible. On March 28, 2016, the ARRL DXCC desk deleted Kingman Reef from the list of collectable entities effective March 29, 2016, and deeming Kingman a part of the Palmyra and Jarvis entity due to proximity of the islands and common administration of the islands by the Fish and Wildlife Service. ^ Including lagoon. Land area 3 acres (0.012 km2). ^ a b Resture, Jane (December 3, 2012). "Kingman Reef". janeresture.com. Jane's Oceana. Retrieved August 14, 2017. ^ a b "Kingman Reef National Wildlife Refuge". U.S. Fish & Wildlife Service. March 28, 2016. Retrieved August 14, 2017. ^ "GAO/OGC-98-5 - U.S. Insular Areas: Application of the U.S. Constitution". U.S. Government Printing Office. November 7, 1997. Retrieved March 23, 2013. ^ "Kingman Reef". doi.gov. Office of Insular Affairs, Department of the Interior. Retrieved August 14, 2017. ^ "Pan Am Clipper Flying Boats". clipperflyingboats.com. HM Magazine. Retrieved August 14, 2017. ^ Stuart A. Sandin; et al. (February 27, 2008). "Baselines and Degradation of Coral Reefs in the Northern Line Islands". 3 (2) PLoS ONE. Retrieved January 27, 2017. ^ White, Susan (March 30, 2011). "Welcome to Kingman Reef National Wildlife Refuge". U.S. Fish and Wildlife Service. Retrieved March 4, 2012. ^ N1DG (March 11, 2001). "The Kingman Reef/Palmyra DX Group proudly presents Kingman Reef 2000". qsl.net. Retrieved August 14, 2017. ^ Hotzfeld, Valerie NV9L (February 7, 2016). "K5P Jet Footage". groups.google.com. Google. Retrieved August 14, 2017. ^ "Kingman Reef (KH5) Deleted from DXCC List". arrl.org. Amateur Radio Relay League. March 28, 2016. Retrieved August 14, 2017. Wikimedia Commons has media related to Kingman Reef.